Caroline Pozo prepares to hit the ball. The sophomore won two of her three matches this weekend. In its second tournament of the season, Northwestern had a successful weekend at the LSU Tiger Fall Classic. Competing against Boston College, Louisiana State, Southern Methodist and Central Florida, the Wildcats won 24 matches, including 14 singles victories and 10 doubles wins. On Friday, in singles matches, the underclassmen for NU stepped up their game. 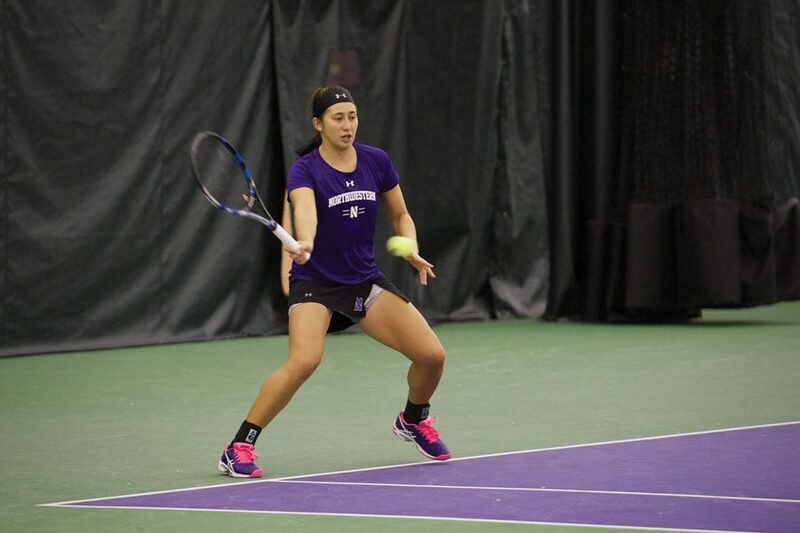 Freshmen Clarissa Hand and Vanessa Streng and sophomores Caroline Pozo and Inci Ogut picked up wins for NU against LSU and SMU. The four teammates cruised to victories, winning their games in two sets. In addition, the Cats also won all four of their doubles matches on the first day of competition. The combinations of Hand and senior Lee Or and freshman Hannah McColgan and junior Julia Byrne both won their matches easily 6-1 over two Golden Knights’ opponents. Fortunately for NU, its success from the first day carried into the rest of the weekend. After winning their first matches on Friday, Ogut and Streng both won two more matches to go three for three in Baton Rouge. Ogut took advantage of her chances in this tournament and the 2018 ITA Midwest Regional, winning four singles matches. Every Wildcat won at least one singles match this weekend except for Byrne and redshirt senior Rheeya Doshi. In the remaining doubles matches on Saturday, NU defeated its opponents in six of its eight matches.Two Wildcats doubles teams, Or and Hand and Byrne and McColgan, won two matches each. Moving forward, NU will look ahead to its 2019 season. The Wildcats will have over two months to prepare before playing their next match. They will open their season against University of Illinois-Chicago at home on Jan. 18.